How to Affordably Design Your Mudroom with Stock Kitchen Cabinets - Columbia Kitchens of Maryland, Inc.
Are you designing a mudroom? If yes, two furniture items you can incorporate in your mudroom are kitchen cabinets and kitchen countertops. 1. Install Built-in bench seats made from stock cabinets. Stock kitchen cabinets make for handy mudroom fixtures such as mudroom cabinetry and seating. For example, custom-built seats in the mudroom look great and you can make this featured furniture item fit in your budget by using small stock wall cabinets as the base of the seat. The most popular bench seats for mudrooms are deep bench mudroom seating. This type of bench is perfect for storing backpacks and jackets behind the sitting area. 2. Create a Cabinet-top Countertop Space. This surface can be designed with a small Island or kitchen countertop. Your family can use the space for folding laundry, leaving messages, charging electronic devices or for sorting and handling mail. You may even want to create a built-in dog crate for your pet as well. 3. Have Open Lockers and Closets Installed. These serve as excellent storage amenities. The open lockers made by faceless cabinets can be used by young children to make for easier drop and hang storage fits. Cubbies can be implemented as well for kids. Vertical cabinets with doors and lower cabinet drawers can be used for adults who need a little more privacy and a cleaner look. Remember, your mudroom should take consideration of how you live to help you tailor your design to meet your family needs. With kitchen cabinets and countertops in the mudroom, you can’t go wrong. No longer will you ever need to worry about your kids dropping and leaving their junk around the kitchen or living areas of your home. Now you and the entire family will have a place to store all things messy to keep the rest of the house clean. 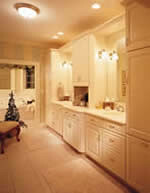 Come to Columbia Kitchens’ show room to see what mudroom ideas are best suited for your living space and family needs. We will help you identify high priority must-haves so you can have the mudroom of your dreams created. At Columbia Kitchens we offer stock builder grade cabinets for immediate purchase or you can choose from our semi-custom and custom lines which are all displayed in our beautiful showroom. When you arrive, we will also show you our vast array of custom countertop options which include: Laminate, Corian, granite, marble, Vetrazzo (recycled glass), Silestone, Cambria, Zodiaq, Caesarstone, Eco, Hanstone, Swanstone, and cultured marble. Columbia Kitchens offers all this plus FREE estimates, FREE design services, and FREE in-home measuring all done by our friendly, creative staff of professionals. Check us out on Facebook, Twitter and LinkedIn! This entry was posted on Wednesday, December 12th, 2012	at 11:19 pm	and is filed under Columbia Kitchens, Home Remodeling, Kitchen Cabinets, Kitchen Countertops, Kitchen Remodeling, Remodeling	. You can follow any responses to this entry through the RSS 2.0	feed. Both comments and pings are currently closed.